Before the period even begins, the classroom comes alive with typical adolescent energy. Students are shuffling into their seats as the door opens and reopens. Hallway activity spills in— there’s books and bodies and chatter and laughter, and, yes, even the occasional screaming. The standard teacher scramble goes into effect. Attendance check, student questions, bathroom needs, and maybe even an office call over the phone or intercom. What a perfect time for social bell ringers. Utilizing a “turn and talk” social activity to begin the period is multi-purposed. First, it gives the teacher a moment to breathe and take on those various tasks at hand. It also allows for the natural need of student socialization. And it can be a nice conclusion to a previous lesson and/or introduction to the topic of the day. Will students take social bell ringer time to talk about whatever they choose instead of the given topic? Perhaps. But with a great prompt, this time can and will be used for both. Students may finish their personal conversations and move into the class content, or may feel motivated to take on the bell ringer first before moving the conversation into its next logical step— a new topic in life. After all, this social/emotional connection is an essential learning, and we are obviously looking to develop the whole child. Healthy communication is a skill to be taught, but as long as conversations are appropriate and attention is called to quality expression and active listening, topics need not be overly rigid at all times of instruction. Avoid too many rules. Unless the bell ringer prompt is extensive, or you want to journal as well, 4-5 minutes is plenty. A group of 2-3 students makes sense, but even 4-5 won’t hurt things. As lessons show a need, social bell ringers are usable up to two to three times a week. Avoid overuse to keep the concept novel and new. – Let kids be kids. Try not to create groups. In this setting, allowing choice in a social group is just fine. Honest reflection is likely to take place in a small group of trusting friends. If a student seems isolated, approach those scenarios with some delicate nudging or even some help from willing students (“Hey, _________, do you mind if ________ joins in your conversation here?”). Give a one-minute warning to allow conversations to complete (which might also get a few groups back on track, if needed). Debrief. Choose to do a quick journal, take example answers to the prompt, or use the bell ringer as an intro to the meat of your lesson— use it as an anticipatory set. Be flexible here. If you find that more focus time is necessary at this juncture in the lesson, don’t be afraid to let the teachable moment shine through. For example, questions may pop up from students… a great way to turn things around is to offer the questions to the class. Instead of always disseminating the answers, or your own thoughts or opinions, it might make sense to be a facilitator and a moderator. In Health Education, this is particularly true with topics where “answers” aren’t always cut and dry. See below for examples. Use the bell ringer prompts in their most basic form to put closure on a previous lesson or as an introduction to the new day. Be sure to script these as a visual somehow, especially in prompts with multiple questions. A lot like the use of simple questioning, put forth a stat (and its source) and go. Anything is possible here. Recent photos from the news, a drawing or art piece, etc. Straight-forward or abstract, all of it works depending on lesson objectives. Movies, TV, and YouTube play a major influence on teen development. Don’t fight this; if a natural incorporation of pop culture makes sense, go for it. 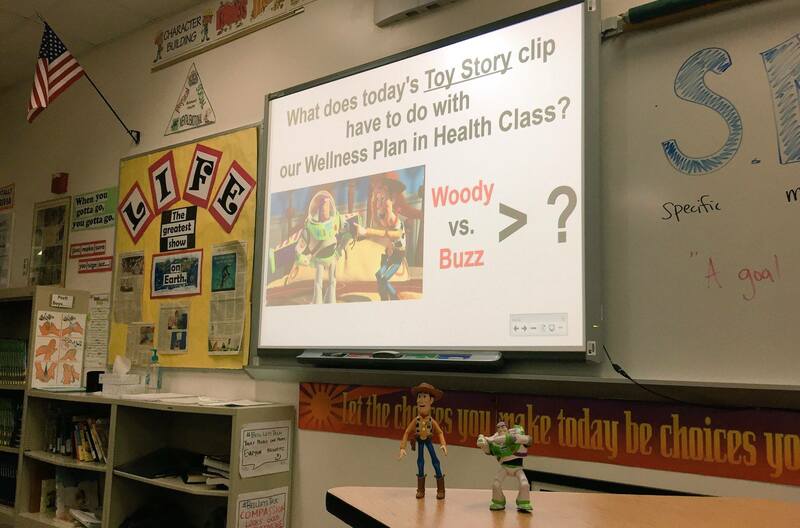 Consider videos outside of typical Health Ed scope so metaphors and analogies can be made. Do you have a favorite social bell ringer? Will you share? Do you share as a large group after a small group bell ringer? Journal? What type of prompt gets the best responses? Question, picture, video clip? Yesterday’s topic? Other examples of journal prompts are shared throughout the school year on social media. Join the conversation!